Say Thanks. 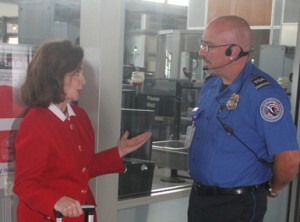 Respect that the TSA people are only doing their jobs and in reality, we are somewhat safer because they are. After I get through the screening process, I always say “Thank you for keeping us safe.” It makes their day and their good feelings come back to me. Plan Your Buckets. Try to count the number of buckets you will need and take exactly that many. Sometimes people in the line are annoyed if you have to put some back or need more than you originally thought. Pay Attention to your Bag Position. Be sure to lay any vertical bags into a horizontal position; otherwise, the screeners may send it back through and that will delay your process, and those behind you. Keep Liquids Handy. If you are carrying on your luggage and have liquids, stick the bag of liquids in the top of your purse or the carryon itself, so that you may get to it easily to take it out. Take Chargers Out. If you have bags of chargers or other electronics with wires, take them out along with computers and other large electronic devices. That will save you the hassle of additional bag checks resulting in further delays. Real Gold Doesn’t Apply. When you’re removing large metal belt buckles or other large metal objects, don’t worry about anything that’s real gold. I have a huge solid gold medallion Buddha I wear around my neck that never sets off the machines. Ask for Private Screening. If you’re selected to be searched, ask for private screening. This screening will take a few more minutes, but is performed behind closed doors—much less embarrassing. If you have any qualms about going through the new body scanning machines, ask when you get to the top of the security line for the private screening and they will not make you go through the machine. Take it to the Bench. Once your items have been screened and passed, if there’s a line, take the buckets to a bench, where you can put shoes and belts back on, without holding up the line. The best rule of thumb: Be as pleasant and efficient as possible; the other people in the line will appreciate it and you’ll get through faster. Posted by Joyce Gioia in Advice for Business Travel, Advice for Family Travel.